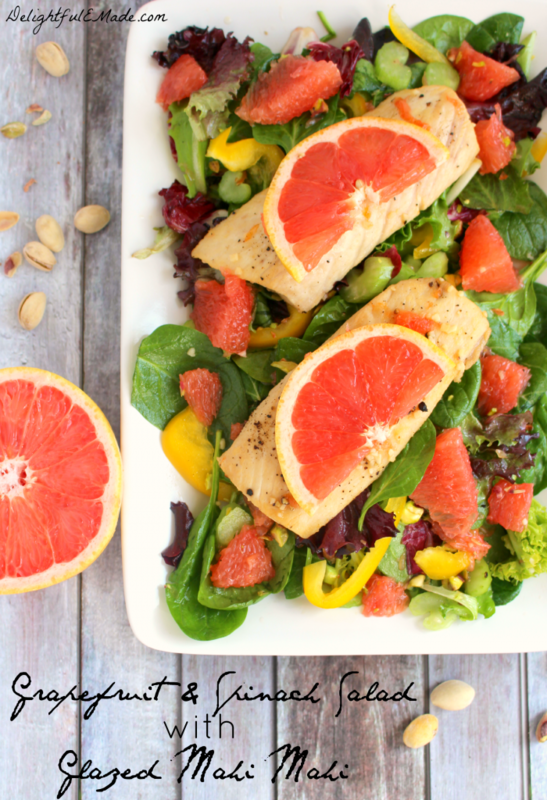 With Grapefruit in its prime, you’ll love this wonderfully fresh and flavorful salad! 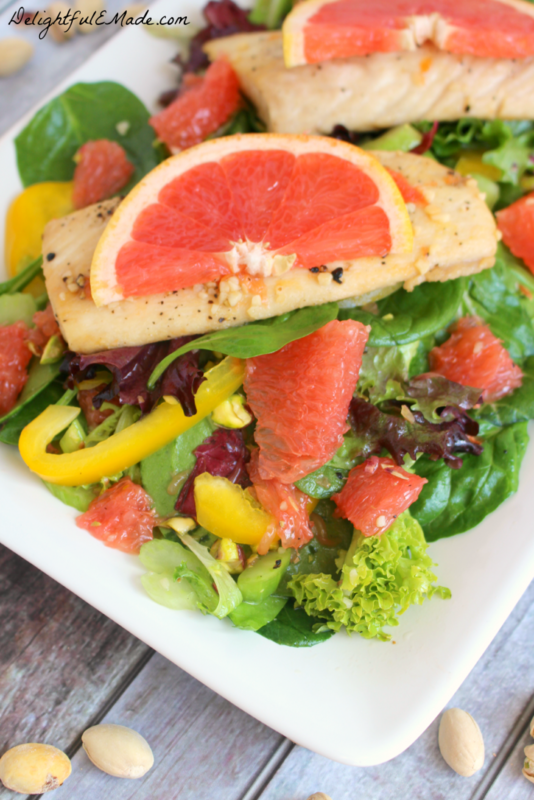 Tossed with delicious Florida Red Grapefruit along with spinach, yellow bell peppers and pistachios, and topped with a grapefruit glazed, pan seared Mahi Mahi, this salad is fresh, healthy and fabulous! 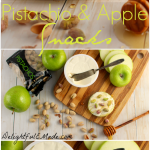 As we move into the coldest months of the year, I always begin craving fresh, crunchy and flavorful foods. I start getting tired of the hot, mushy food that come with winter, and really begin crave colorful, juicy, crunchy foods. 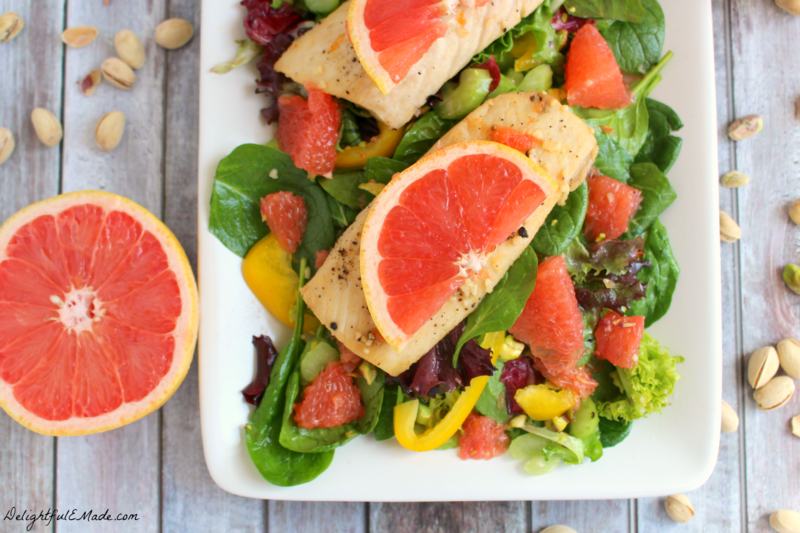 If you can identify, then this Grapefruit and Spinach Salad with Grapefruit Glazed Mahi Mahi will totally hit the spot! This salad is the epitome of fresh, healthy and flavorful eats and is a wonderful feast your eyes just as much as your body! Now is the perfect time of year to get these gorgeous Florida Red Grapefruits. Florida grapefruit is at its sweetest and juiciest right at the peak of winter (January-March), making it a great source of delicious, ripe fruit at a time when many others are not available. Florida’s unique fertile soil and lush subtropical climate are what make Florida grapefruit the sweetest and juiciest variety of grapefruit in the world, but they can also take a toll on the outer appearance of the fruit – don’t judge a book by it’s cover! My fruit had some little black spots on the outer rind, but not to worry – as you can see, the interior fruit was a gorgeous red and was sweet and juicy! 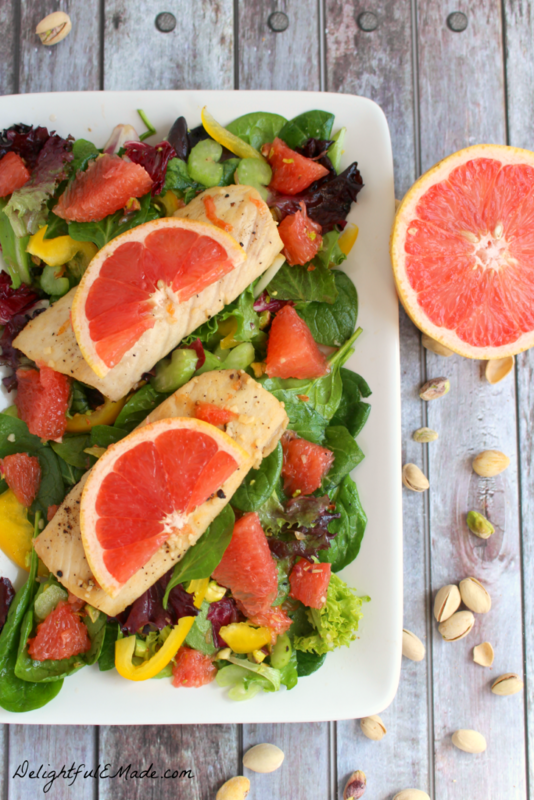 The grapefruit in this salad is absolutely the star of the dish! Not only does it pair perfectly with the spinach, yellow bell pepper, celery and pistachios, its a wonderful way to liven up an ordinary salad with some lovely color and flavor. I also used fresh squeezed grapefruit juice to make the dressing for the salad, which adds a fantastic complimentary flavor to the salad. To keep with the grapefruit theme of the dish, I also added a fantastic grapefruit glaze to the Mahi Mahi. 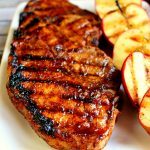 I love adding a citrus glaze to fish, and this easy grapefruit glaze is a nice variation to the standard citrus glaze. The fish takes just a few minutes to sear on each side, and while it cooks in the pan, I continually spoon over the glaze on the fish. 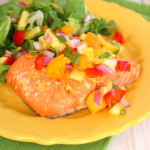 You’ll be amazed as to how delicious and flavorful the fish will be, thanks to the grapefruit glaze! 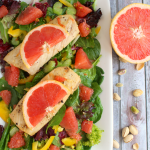 Tossed with delicious Florida Red Grapefruit along with spinach, yellow bell peppers and pistachios, and topped with a grapefruit glazed, pan seared Mahi Mahi, this salad is fresh, healthy and fabulous! In a large mixing bowl, add the spinach/arugula blend, and toss in the grapefruit sections, yellow pepper, celery and pistachios. Set aside. Mix glaze in small bowl by whisking together the grapefruit juice, honey, brown sugar, garlic and salt & pepper. In a large skillet, heat the olive oil on medium high heat. Pat the fish fillets dry with paper towels, and add a bit of salt and pepper to taste. Let sear for 3-4 minutes. Flip over to other side, and pour the glaze over the top of each fillet. As the fish cooks for the final 3-4 minutes on second side, continually spoon the glaze over the fish. Remove fish from heat at serve with the dressed salad. Enjoy right away. 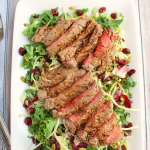 Not only is this salad a wonderfully delicious dinner idea, its very healthy! One-half of a Florida grapefruit contains at least 100 percent of the recommended daily amount of vitamin C, an important nutrient that can help support a healthy immune system. And when paired with the other vegetables in the salad, and the lean protein of the fish, you’ll be providing your body with a really nutritious meal! I had Mahi Mahi on our vacation to Mexico last month and I am hooked on it! This salad is just beautiful and I think it needs to happen ASAP! This not only looks beautiful I bet this is amazing! 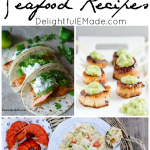 I'm always looking for great seafood recipes. 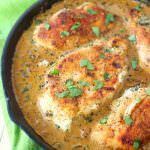 We eat lots of fish and I love how you used grapefruit in this recipe. Pinning!